Glenn Rhee ~ "Rule number one of scavenging. There’s nothing left in this world that isn't hidden". 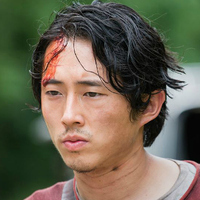 Glenn Rhee was originally from Michigan, born of Korean immigrants. He moved to Atlanta sometime within his adult years, he delivered pizzas for a living. As it turned out, his knowledge of every short cut in Atlanta proves extremely useful to the group's scavenging needs. In the episode "Cherokee Rose", Glenn wears a shirt that has some Boy Scout markings on it, a sign that he might have been a Boy Scout. He knows the city fairly well and can navigate his way through back alleys and the streets . 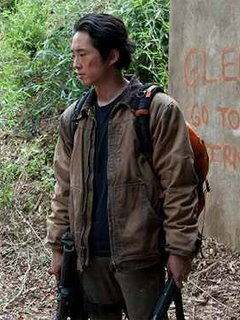 When the outbreak began and the city was converted into a refugee center, Glenn, being resourceful, was able to survive despite the city quickly being overrun by walkers. He mentions having been saved by T-Dog before linking up with the rest of the Atlanta Camp. In the episode, "Nebraska", Glenn talked about his mother and revealed that he has multiple sisters, but their fate after the apocalypse is currently unknown. Glenn is bright, loyal, resourceful, quick-thinking, and brave. Keenly aware of the extreme dangers he puts himself in for the group, his youth makes him willing to take the risk. Glenn thinks on his feet and shows great compassion and humanity. Despite all the horrors he has seen, he maintains a youthful enthusiasm for life and its unexpected pleasures. He is an integral part of the group, showing surprising depth and emotion when experiencing even the most devastating tragedies. While on the farm, he begins a relationship with Maggie Greene. Over the course of the latter half of season two and the third season, he has become extremely close and loving toward her, doing whatever is necessary to keep her safe. He is trustworthy and loyal, as seen in the episode "When the Dead Come Knocking", when Glenn and Maggie are captured by The Governor, he is brutally interrogated by Merle but will not reveal where the rest of Rick's group have set up camp. Glenn's love for Maggie and his close bond with her father, Hershel Greene, lead Glenn to become less of the group canary in the coal mine and more of his own voice. 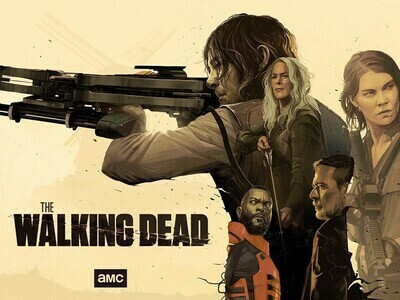 Upon Hershel's death, Glenn pledges to take over his role as conscience and hope, which involves decisions like protecting Tara Chambler in spite of her ties to The Governor, and encouraging Rick to spare the residents of Terminus.